Cancer researchers are increasingly tapping into the body’s immune system, especially the T cells, to find a cure for diseases like multiple myeloma. A more recent development in this immunologic approach is called “adoptive immunotherapy” – wherein the T cells in the body, whether in the blood or in the marrow, are first depleted or cleaned up, and then, engineered or activated T cells, more capable of attacking tumor cells with high specificity, which are cultivated and expanded outside the body, are transferred back to the marrow. Researchers have found that #immunotherapy is more specific and targeted and hence is safer with fewer side effects than chemotherapy. Chemotherapy in general, attacks all rapidly diving cells, for example, hair follicles and gastro intestinal lining, along with the rapidly dividing tumor cells, and thus has more dramatic side effects. 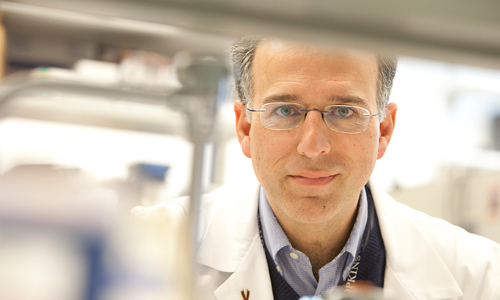 Dr. Ivan Borrello, Associate Professor of Oncology at John Hopkins School of Medicine, found out a new type of T cells to play with – called the Marrow Infiltrating Lymphocytes (MILs). He was on #CureTalks, telling us about his work on this completely novel approach. Let us understand briefly, what attributes of MILs make them a better candidate for immunotherapy. What are MILs? Lymphocytes are white blood cells engaged in recognizing and killing foreign cells providing immunity to our bodies. These can be found residing in the bone marrow or circulating in the peripheral blood. The ones circulating in the peripheral blood are called peripheral blood lymphocytes (PBLs). The ones residing in the bone marrow are called Marrow Infiltrating Lymphocytes. How does it work? In order to be killing cancer cells effectively we need to create an army of activated MILs. What does that mean? It means that these MILs need to be activated and expanded in vitro to become cancer killers, because by nature, they are very unresponsive and are too few in numbers. So, they are activated or trained to recognize specific proteins on the tumor cells surfaces. Once activated they are then expanded in vitro to large numbers, so that they have full manpower to launch an attack once they are confront the tumor cells in the patient’s body. How are MILs different than Peripheral blood lymphocytes (PBLs) that are trained in a similar fashion – for example the CART cells (Chimeric Antigen Receptor T cells)? The T cells derived from the peripheral blood such as the CAR T cells are engineered to recognize only a certain protein that’s present on the surface of the tumor cell. So when these engineered cells recognize the tumor cells with that particular protein, the CAR T cells proliferate and kill those tumor cells. The MILs, on the other hand, have a much broader ability to recognize a wide variety of proteins on the surface of the tumor cells than do cells that obtained from the blood. So when the patients treated with CAR T cells relapse, they come back with a tumor that has a new type of antigen or protein on their surface, something which the present CAR T cells are not prepared to recognize and attack. This is something very similar to the antibiotic resistance problem that is widely seen in patients overusing antibiotics, due to which many bacteria become resistant overtime. On the other hand since the MILs can recognize potentially a huge variety of proteins on tumor cells, this problem of developing resistance becomes significantly lower. Also, Dr. Borello found that the MILs expand more rapidly on stimulation and have more specificity as compared to the PBLs. Moreover, the MILs can migrate back to the bone marrow with much greater ease, once injected back into the patient’s body after activation and expansion. What about the side effects? Dr. Borrello observed fever and diarrhea as the major side effect in MILs treated patients, but says that the patients improved on their own without having to be actively treated for any other complications. He believes that the benign nature of MILs based immunotherapy would make it possible to administer it in early or smoldering stages of the disease, benefitting this category of patients as well. Dr. Borrello and his team have patented various aspects of this technology and are interested in licensing it to various companies. We look forward to see MILs as a successful drug towards #myeloma #cure. Thanks for sharing. Would love a link to the original publication.